In my last post I touched on how my front brake has given up the ghost. I put it off for a little while but was getting really itchy when I couldn’t get out and ride my bike. 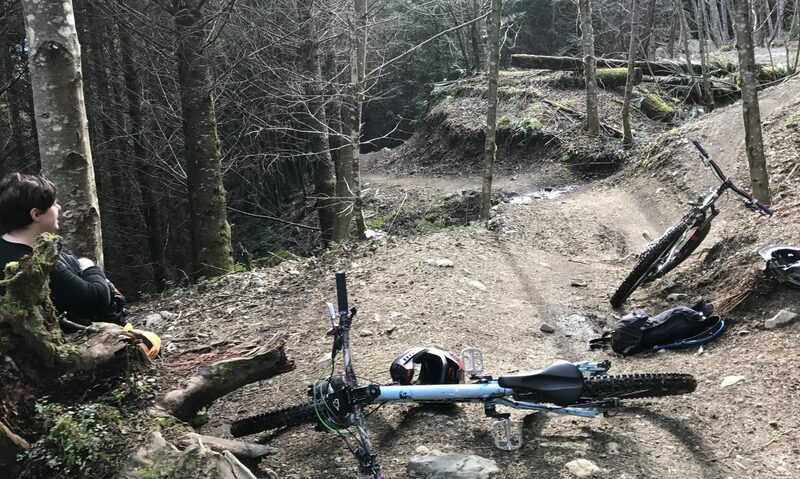 True, I did one trip out and used Ryan’s hardtail and then swapped it for our friend’s full suspension downhill monster bike (talk about opposite ends of the spectrum!). Both were fun but I was on new trails and I was missing poor Jenny. It was time to take the matter into my own hands! I decided that I had enough money to replace just the front brake. I would’ve loved to do both at the same time but I’ll have to wait a bit on that I think. I was also super keen to put my new mechanic skills to the test and actually take it home and install it myself. This journey starts with a bit of research but I decided which kind of brake I wanted and headed into the shop. My history with bike shops has been pretty good, actually, but I’ve found that I spent a lot of time beforehand studying what to say and how to say it to make it seem like I have some idea of what I’m talking about. Mostly I’ve just given up on that endeavour as it’s always better to just admit when you don’t know something and ask for help, but I still get a bit nervous that I’ll be looked down upon for my ignorance. I headed into Dunbar Cycles and, luckily, was mostly just tired having come from work and didn’t have time to feel nervous. I walked up to the service desk and, astoundingly, found myself saying words like I knew what I was talking about…. wait a minute… I DID know what I was talking about! There wasn’t a panicked text to someone about a question I didn’t know how to answer or even much of a pause in the conversation for me to think! Honestly, it felt so good to be asked a question and know exactly what the answer is. It’s quite the turning point in my biking career and I loved the feeling of it! Hell yeah I can tell you about my bike and its parts! So I get the brake home and look at it. It looks familiar. There’s nothing too foreign about it in comparison to the brake I had already. I can do this! I must say without help of Ryan OR Youtube I changed the pads (swapped organic for metallic), changed out my rotor for a gently used one, installed the brake, routed the cable properly, and got the lever on in the right spot. I must say the moment I put the wheel back on I was holding my breath a little bit, worried it would somehow not fit… or explode… or something dramatic that ruins my entire bike. But it slid right in, fit like a glove and I felt so proud that I used what I’ve learned and that I have the confidence to just tackle it without second guessing myself (too much)! I’ve already taken it out for a ride and had a blast. It took about half a lap for me to get used to it but after that it felt totally fine. I think it may need a bleed so I’m going to get a kit and do it myself rather than go to the shop. I’ve got this! I know sometimes these things can feel incredibly daunting and intricate. It feels like somehow you’re going to do one little thing that will absolutely ruin the entire mechanism or even bike itself. My only advice for people like me who get nervous about this stuff to seek out and take a bike maintenance course. If you’re in BC and can make it to Abbotsford, I really do recommend taking the UFV Bicycle Mechanic course like I did. I feel so much more confident because I got to play with bikes, screw up, realize it wasn’t a big deal, and learned how to fix what I’d done. That alone is worth so, so much. What about you folks? What are your home mechanic victories? I have to start this by apologizing for not posting more than I have been. The weather’s been awful and I’ve been working non-stop which leaves precious little time for bikes (or sleep) BUT I have had the fantastic opportunity to go to the University of the Fraser Valley Bike Maintenance Level 1 Course. This course ran once a week for 6 weeks and taught us the basics of bike maintenance. After this class I can do a full tune up on my bikes as well as some more advanced skills like brake bleeds and hub overhauls. My first try at wheel truing. Does this look straight to you? The (more than qualified) instructor for the class is Bruce Wenting, owner of Wentings Cycle & Mountain Shop. It would not be an exaggeration to say that this man knows and loves bikes. He had awesome stories about every kind of biking you can think of from road races, to cyclocross, to old school mountain biking. We were all definitely in good hands. He taught us so much and was able to answer all of our questions, and even solved the mystery of my constantly breaking spokes! We worked on a variety of types of bikes and the last couple of classes we paired up to work on our own bikes! Jenny has never looked so good! Dirty brake fluid from my gnarly summer of hard riding. 1.) No matter how many times I’m told not to, the only thing I ever want to do is squeeze the brake levers when the wheels are off on hydraulic brakes. This is a no-no as it can cause the pistons in the calliper to get stuck which means you need to reset them. I did this no fewer than FOUR times when working on my partner’s bike and eventually stopped apologizing and just pulled out the brake pads to fix my blunder yet again. It was funny the first 2-3 times. 3.) When throwing out cables and housing in a metal garbage can, either don’t coil them at all or make sure they’re secured well when coiled so they don’t spring open in the garbage can with a loud crashing noise and get yourself called “rowdy” by the teacher. Another cool thing I’d like to note about this program is that it’s held in the UFV Aerospace Centre in Abbotsford. This is where people learn to work on planes. Planes! How cool is that?! So we were all fixing our bikes next to empty planes in a hangar. Not to mention the bunch of them outside. Bikes were also made to fly. This is also the home of Paul Brodie’s Bike Frame Building Course where you actually design and build a frame from start to finish, all the while being guided by the legendary Paul Brodie. You walk away with a bike frame that you get to build. I’d be lying if I said I wasn’t tempted to do that for a hardtail frame. But one thing at a time. I will most likely be taking the Level 2 of the bike maintenance course when it’s offered in the new year to learn things like suspension maintenance and wheel building. Jenny ready for her makeover. I’m so excited to not have to take my bike into the shop for everything anymore. Working on your bike may seem scary at first but it is honestly so fun and accessible! I encourage anyone out there with a bike to take some sort of course to at least know the basics of how to take care of it. It saves you money and gives you a deeper understanding of your bike and how it works. Happy trails and stay dry!